Today’s post is part of the Writing Process Blog Hop, which I was invited into by fellow blogger Setsu of KatanaPen. Setsu writes thoughtful posts about the writing and publishing journey, and loves to explore the nature of being an artist. She comes from a martial arts background, and so has many unique experiences to draw from. Through her musings, Setsu likes to apply martial arts philosophies to writing so that her readership may learn from the parallels. Though immensely talented and dedicated to her craft, Setsu is also one of the kindest and humblest bloggers I’ve encountered. She is very receptive to other bloggers, so I urge you to drop by her blog, follow, check out a few posts and introduce yourself. Anyway! As part of the Hop, I’m answering four questions about my personal writing process and then passing the baton to three other bloggers whose blogs you will no doubt enjoy. I’m currently sitting on six or so short stories, each in various stages of completion. On top of these, I have an even dozen requiring further redrafting. I will typically pull these out when I’m hiding from more pressing projects, or if a relevant competition arises. I’ve thoroughly outlined and put down about 15,000 words of a post-apocalyptic novella – itself just a small entry in a much larger fictional universe I have conceived. For a class (and for Camp NaNoWriMo), I’m writing a long science fiction short (15,000 words), which, as per the assessment task, will be self-published in late May. Kind of nervous about that one. It’s my first proper dabble in genre-writing and my literal first foray into self-publishing. Also for a school assessment, I am working on a single-issue digital horror magazine, tentatively titled Macabre Monthly. Then there’s this blog. I’m not sure. Questions like this make me uncomfortable. It differs because it stems from my experience and imagination, which are unique to me. I love tight sentences and rich, complicated characters. I describe my writing as literary fiction, but strive to keep it ‘fun’. I try to avoid writing anything dry or lifeless. Humour (when appropriate), pacing and dialogue are important to me. I love beautiful language, but hate the idea of alienating anyone. I guess you could say I like tackling literary themes with pop fiction sensibilities. I write for personal enjoyment, and I write the things I write because the stories I want to read aren’t being told – at least not in the way I want them to be. In my more ambitious stories, I like giving voices to the marginalised. On a deeper level, I find writing the easiest way to articulate my ideas. I’m a terrible communicator – so much so that many people I work or study with often misunderstand or underestimate me. It can be frustrating when people perceive a correlation between my intelligence and poor communication skills. Consequently, writing feels like the most natural and honest method of expression for me. I find it empowering. Still working on this. My processes are all over the shop, which is why I seldom see things through to completion. I’m ill-disciplined. I write frequently, but project hop. School and this blog have helped, but I’m hoping to carve out some regular, dedicated writing time. I also need to stop editing as I write. Michael is a blogger, freelancer, artist, short story writer and aspiring novelist. His website is all about his projects and the writer’s journey. Phenomenally nice guy. I don’t think he’d object to me calling him a film, sci-fi, horror and video game enthusiast, either. Vera’s a dear friend of mine and her blog, though still in relative infancy, shows huge promise. Vera writes about the writer’s journey. Her brilliant posts stem from her experience as a scriptwriter, film and music buff, editor, and avid YA writer and reader. Amanda is a recent alumnus from my Writing and Publishing course. (Weirdly, because we were in different years, we’ve hardly spent any time together in person, but have become good blogging pals!) Amanda is an absolute workhorse. Not only is she a hugely dedicated prolific writer, but she also fearlessly applies for every opportunity that comes her way. I greatly admire her work ethic, and her blog – which is choc-full of great writing-related content – is well worth checking out! Flash fiction has always interested me. This could be because I’m a naturally verbose writer (see: every post I’ve written to date). To me, short short fiction has always seemed elusive and challenging. My attempts at it feel more like disposable exercises than fully formed pieces with arcs and merit. Indeed, writing good flash or micro fiction requires a very specific skill set. So to get some much-needed practice, I’ve decided to join Flash! Friday, a flourishing flash fiction writing community. It’s pretty simple: every Friday morning a prompt is given via Twitter and the Flash! Friday blog. Writers then have twenty-four hours to conceive a seventy-five word response and share it in the comment section of the blog, or by using the #FlashFridayFic hash tag. Every entry is read and assessed by a judge (a different one each time, I believe?). Both the winners and the highly commended receive exposure and Glory!™. Crucially, there’s no pressure: from what I can tell Flash! Friday is all about having fun, getting some feedback and being held accountable for keeping a regular writing schedule. It’s also further supports the argument that Friday is the best day of the week. If any of this sounds interesting, follow FlashFridayFic or visit their blog. Also, watch this space: I plan on sharing some forthcoming flash fiction pieces on this blog. I figure it’s about time I subjected you to my fiction. Let the madness ensue. For one, it’s not in November. 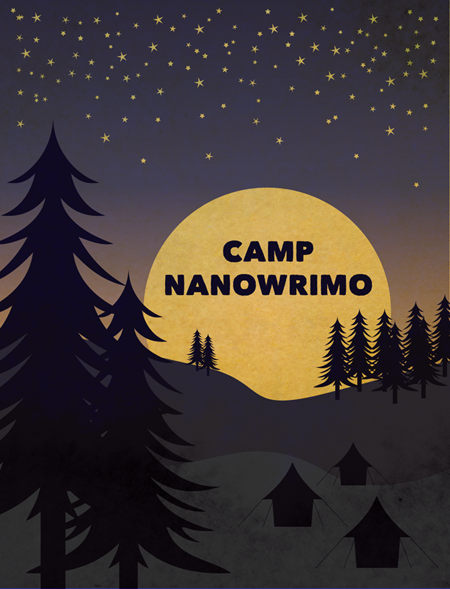 For another: There’s an option to band together with other writers in a virtual ‘camp’. By doing this you can encourage one another, share work and hold each other accountable. It’s completely optional and you can, of course, go it alone. It’s NaNoWriMo as a team effort. Today I thought I’d take down two enemy choppers with one rocket: in this post I’ll be sharing one of my published pieces of fiction and drawing attention to a lit mag that is fast becoming an iconic part of my local community, the City of Darebin. ‘inScribe’ is an arts and culture magazine that is distributed freely around the Darebin area (typically in cultural hotspots, like cafés, libraries and community halls). It is produced by students of NMIT’s Bachelor of Writing and Publishing course and an editorial committee composed, I believe, of council workers and locals from the area. ‘inScribe’ exclusively publishes work by writers who live, work or study in the Darebin area. This gives it a distinct aesthetic and effectively showcases the diversity of our culture. ‘inScribe’ publishes poetry, short fiction, book and café reviews, articles and visual art. The articles they’ve published in the past have been about writing, publishing and the community at large; I recall there were some rippers in Issue Six about the state of the publishing industry. Though it is a print publication, the PDF of their current issue, Issue Seven, can be found here. 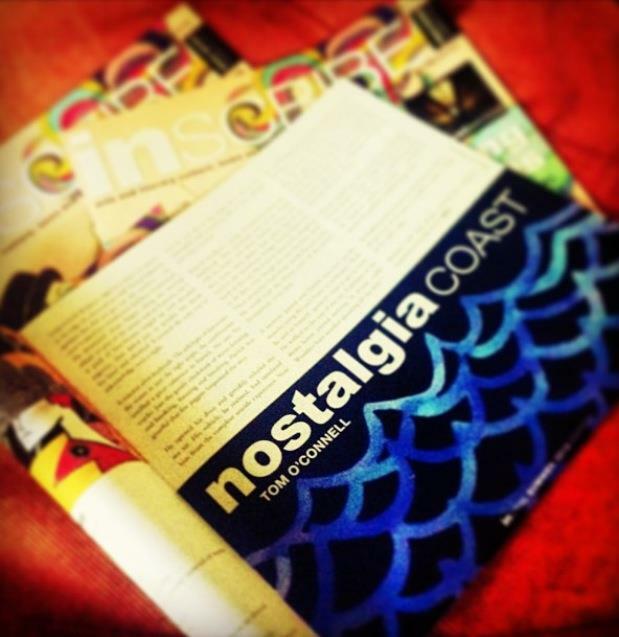 My piece, ‘Nostalgia Coast’, can be found on page seven. Though I don’t wish to sound too self-congratulatory or go on about my experiences, I did want to mention that I really enjoyed working with their editorial team. I found them to be both thorough and respectful. I’m also a big fan of Emma Wiesenekker’s accompanying artwork (evidenced below). I feel it really complements my piece – and that’s true of all the other illustrations, too. ‘inScribe’ is a very striking publication. I wanted to write about ‘inScribe’ because I think it’s a great council initiative, one that deserves the support of all Melbournians if it’s to be sustained. Before I moved to the area – from the Gold Coast, an area bereft of culture – ‘inScribe’ was the kind of thing I dreamt about having in my community. It’s great for emerging writers and artists, and it can add a touch of class to any café window front. Council-funded art initiatives are hard to launch and even harder to sustain, so we have to make sure we don’t take them for granted. If you’re reading this and don’t live or work in the Darebin area, you can still access PDFs of every issue here. The team at ‘inSribe’ welcome feedback; the magazine is constantly evolving in accordance with the comments they receive (as evidenced by last year’s transformation from a newspaper format to a glossy, vibrant magazine). If you do live, work or study in Darebin and you’d like to submit something, check out the submission guidelines.